The May/June issue of Vineyard & Winery Management has a series of articles I wrote. The first is on the search for a perfect closure; the second is on Oregon's Salud! program; the third is on the worsening vineyard labor shortage; and the fourth is on proposed changes to appellation label laws (Note: all links open .pdf files). 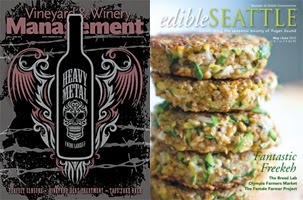 Additionally, the May/June issue of Edible Seattle has an article I wrote on Fielding Hills. See a list of newsstand locations.